The original MCAP was a success, however some users wanted a more quiet variant. So I took the main ideas and applied a zipper based design. The end result is not as speedy to access, but has full security closure with the zippers and can be opened with minimal noise. The Stealth can't hold two 30 round NATO mags vertically like the MCAP can, but a user can fit a single mag in the main pouch diagonally. While I was at it, I adjusted the interior to give more item handling options. The outer front has a generous amount of loop / pile and the back has a full set of PALS webbing to allow for the most mounting options. The Frontal pocket is slightly shorter to assist in making a tactile separation of the pockets without much loss of space. During the prototyping phase, side elastic compression proved ineffective so the sides now have traditional webbing for attachment points. Although the core is 1000D, when possible, 500D cordura was used to reduce weight and add flexibility. 2 color matched long Malice clips are included with each pouch. I'm very happy to be able to say the Stealth pouch is a collaboration effort being designed by Mil-Spec Monkey and manufactured by Tactical Tailor in the USA. 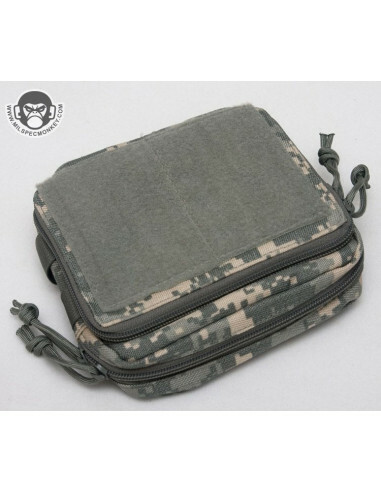 Overall DIMS: approx 6.75" x 6.25"
Depending how much you pack this bad boy, it can get pretty thick so that is why I deemed it a Utility / Admin pouch rather than just an Admin pouch. Works great on vests or as additions to larger packs. Currently available in TT colors of Marine Coyote, Multicam, ACU, Foliage, Black, and OD Green. 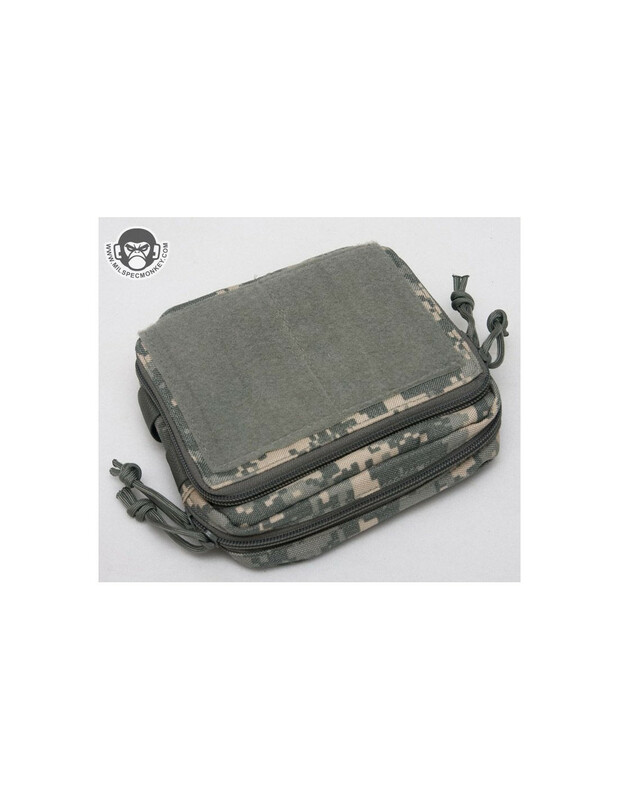 -No other patches or tactical items are included. Frontal Map pocket: 6.5" x 5.25" x 1"
Starting in the back is a sleeve pocket with horizontal elastic webbing incorporated. The divisions work well for multitool sized objects. In the middle is a handy removable map case using heavy gauge clear vinyl. Keep it in for quick intel, or take it out for more storage capacity. This is also handy if you need to quickly display documents. The frontal area has another sleeve pocket with vertical elastic webbing great for holding pen like objects. When the frontal pocket is fully open, the zipper placement allows for hands free viewing of the map panel. Main pocket: 6.75" x 6.25" x 1.5+"
In the back is another sleeve pocket for assisting in item division. On the sleeve and on the other side are 2 rows of horizontal elastic webbing. Having 2 rows helps acoomodate more item lengths. Larger loops are staggered between sides to allow for bulky item containment such as medical supplies. The rest of the loop divisions are a good multitool size which works well for other items such as flashlights, pistol magazines, chemlights, folding knives, and more. The construction of this pocket allows for good expansion when it is desired to really fill up this pouch.